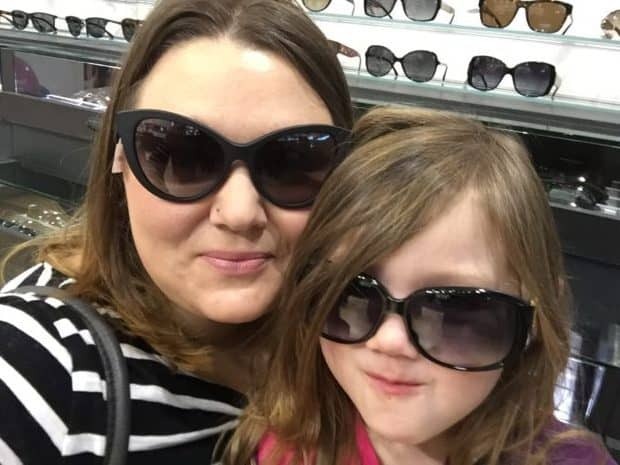 Recently Sophie and I had the chance to do some shopping at the Edmonton International Airport. When we arrived we parked in Valet parking, which is a convenient option especially when you have kids. At the check in I was amazed at the services that I was offered. Did I need an oil change? Was I good for gas? Maybe I needed some groceries? All of the services are offered through the concierge at Valet parking (at street prices) but we were only going to be there for a couple of hours, however, I really should have taken them up on the offer for grocery shopping! When deciding who we would be shopping for Sophie picked Kris and said that we would be shopping for Christmas! 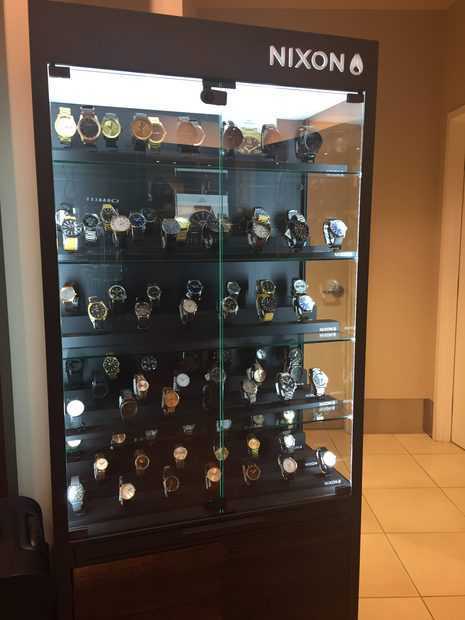 After we passed through security we spent the next couple of hours searching for the perfect gifts. The great thing is that after security there is a great selection of over 10 retail stores and kiosks to shop from. 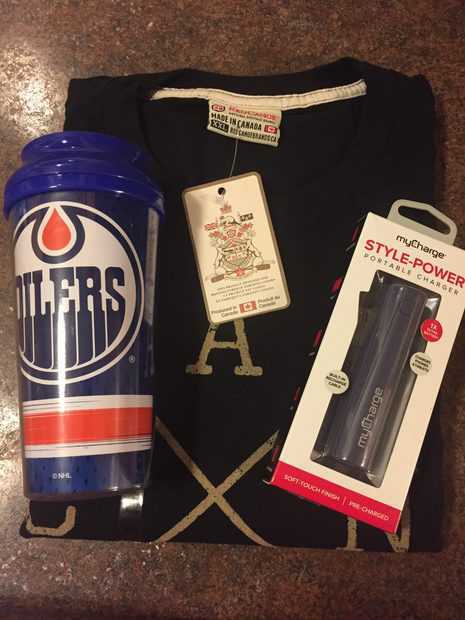 Whether you’re looking for a nice bottle of wine, a good selection of Edmonton Oilers + Edmonton Eskimos items, a book, popular kids toys, clothing, or even an iPad, you can get it right at the Edmonton International Airport. 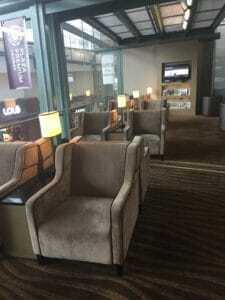 In the middle of shopping, we took a short break to check out the Plaza Premium Lounge. The lounge is family friendly (bonus!!) and also has comfortable seating, television, as well as a food and beverage area with an assortment of options. 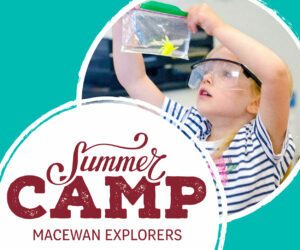 The cost is $40/person which includes food, drink and amenities, and if you are an EIA rewards member you save 25% off the price plus are eligible for other great perks at the Edmonton International Airport such as entering contests. After some decisions, we finally decided on 3 gifts. Kris is always on his phone, and always on the go. This doesn’t bode very well when you rely on your phone. The first gift we picked up was a portable phone charger from Tech on the Go (I’m sure that Sophie also knew this meant she could have a mid-day facetime chat with daddy again). The next item we bought was a T-Shirt from Discover Alberta. This store has a good selection of T-Shirts, products from Rocky Mountain Soap Company, as well as Edmonton Oilers and Toronto Blue Jays clothing, hats, underwear, and more. We settled on a Canada shirt in black. Perfect for a casual day out with the family! Last, we paid tribute to Kris’s (and Sophies) favourite hockey team and his love for coffee and purchased a to-go Edmonton Oilers coffee cup from Hudson News. This was basically a given as soon as Sophie saw it as it was something that Daddy just. had. to. have. Other than shopping it was quite awesome to experience the other fun things around the airport. Travelling with kids is a little easier with the children’s play area located in the Domestic-International Departures and US Departures. Pet therapy dogs make their rounds every week to visit with people waiting for their flights and offer a great distraction for those who are feeling the pre-flight jitters. And if you enjoy music EIA also has a variety of musicians from folk singers to harpists to fill the airport with beautiful music. 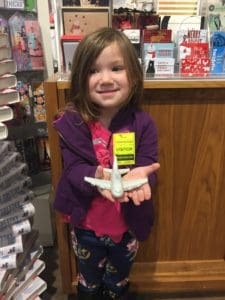 Whether you’re coming or going, need to shop for a forgotten item, have decided to save all of your shopping for before your flight or just want to explore the Edmonton International Airport has you covered. This post was sponsored by the Edmonton International Airport, however, all opinions expressed are of my own!